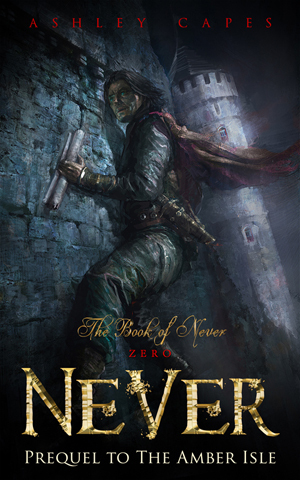 I love adventure stories and rogue characters who also have a good heart, and so when I had the idea for 'Never' and his search for his true name the story pretty much started to flow. The epic fantasy setting was also heaps of fun to use, because it allowed me to get a good dose of magic into the story too. Air rushed from Never’s lungs as the brute landed another blow. Never choked on a curse as he doubled over. The two other guards lifted him again, grip tightening further. “I can’t help feeling… there are other ways to tell me… Lord Firmita is busy,” Never gasped as he glanced up to the leader’s silhouette. The man was a hulking figure before the torchlight that caught in the warm breeze and twisted across stony manor walls. There was not much to see, just two glittering eyes in a darkened face. The man’s lip would be bleeding too, courtesy of Never’s elbow. Rough hands snatched the pack from Never’s shoulders. Another man searched his vest and the inner pockets of his cloak, removing several knives and tossing them to the grass. The rebuke could have been directed at himself – he’d misjudged them. Quite clearly his story of meeting Firmita in the garden had been pretty thin, especially now that he was being robbed by the man’s guard. Given a chance, Never might still talk his way into a meeting with the lord of the manor and find what he needed. Unless his blood got free. Then, no amount of talk would make a difference. But so long as they didn’t cut him, everything would be fine. Offer no resistance, let them search. Keep calm. “I’m just as disappointed as you,” Never said. The man folded his arms, muscles bulging beneath the edges of his tunic. Red and yellow strips appeared near black in the night but the white from the rest of the tunic seemed bright enough to shave by. So clean. How did they manage it? Testament to Lord Firmita’s fastidiousness, perhaps. “Wait a minute,” the guard holding his pack said. “What’s this? Diego, want to take a look?” Never sighed when the man carefully lifted a wrapped relic then unwound the cloth to reveal a hunk of carved stone shaped as a fish. Or so it seemed at first glance. “Good guess,” Never muttered, unable to stop himself. “Shut your mouth,” the leader, Diego, said as he waved the men closer. In the yellow glow of the torchlight, carvings on the piece of stone glittered – the granite he’d worked into the surface to mimic scales and more, to mimic the old relics once commonly found near the Sand Cliffs. The way the guards’ eyes lit up suggested it had fooled them – but would it fool their lord? And would Never even get a chance to attempt his ploy? After trying for weeks to arrange a meeting with the collector, some boldness had seemed in order… but there was boldness and there was foolishness. “Now this we can sell,” one guard said. “Charming,” Never said. And just why had guards taken up thievery? Diego flashed an evil grin before stalking off into the darkness. One of the guards kicked Never in the back of the knees. He fell, cheek thumping against the grass. Never growled. No matter how neat Lord Firmita kept his grounds, there was nothing to be done about the immediate itch. Bu held Never’s own dagger against his throat while the second fellow searched, finding the knife strapped to the small of his back. “We can sell a few of these at least,” Bu said. “Not being paid well enough?” Never asked. “Diego said shut up,” the other guard snapped. “Just one more thing – you forgot my boot,” Never said. The man grunted as he shuffled down to remove that blade too. That was all of them and it might build some trust, which he needed if he was going to survive long enough to get a proper look at Firmita’s collection of ancient relics. On the other hand, he was inside now, and sometimes that was half the battle. Being captured and unarmed made everything more difficult, admittedly, but life tended to be dull without challenges.